Really good freight cars are expensive these days. I am interested in multiple eras. Sometimes, you can have cars work for multiple eras. In the future, I will probably have an announcement on the Rails West site about a 1975 era project. 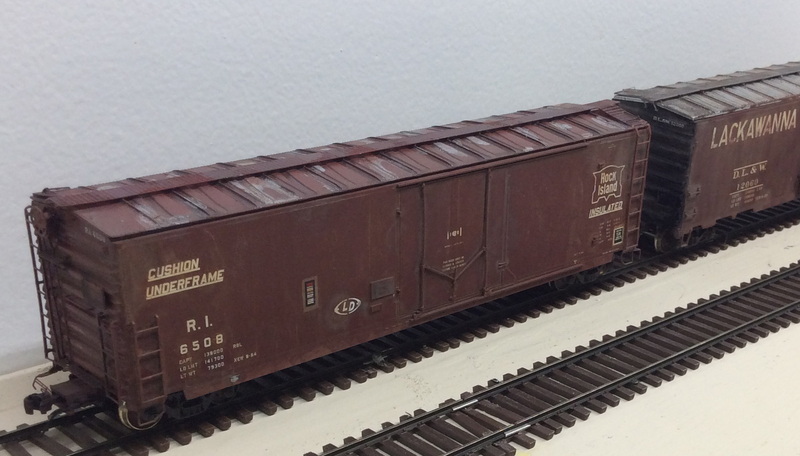 I recently weathered and detailed two cars to be able to operate on my 1975 project and my primary Rails West layout 1979-81. The DL&W car is an Atlas model. It is a nice car, but the roof walk was a bit thick. I used the roof walk off a recent Moloco Wabash project, and it fit nearly perfectly! The Moloco roof walk made the DL&W car look much better. I also added scale wheels, pin lifters and brake hoses. The dual era trick comes from decaling each side a bit differently. Here are the 1975 sides–no yellow wheel inspection dot and a single lube panel. In the 1979+ side, the COTS and yellow dot surface. Subtle but really signals the era change to the astute observer. 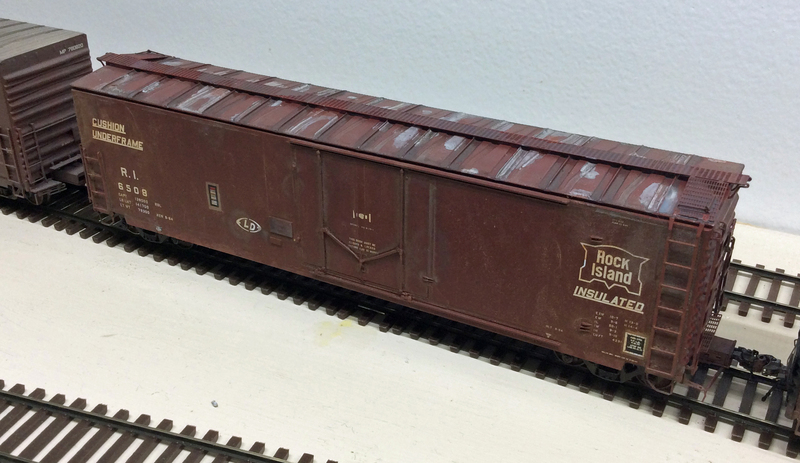 For the roof on the RI car, I employed the gray-silver splotch technique on the roof to suggest some peeling paint. I like having the diversity of different roof configurations. It was a pretty mixed bag in the 1970s and into 1980s as cars were retired or re-built. All in all, this was a pretty rewarding set of projects and my 1975 project now has a couple of cars ready to go. The Rails West layout also got some handsome, older cars when the “yellow dot” side is showing. The first two cars in this line are Moloco. Moloco makes among the best cars one can find today. There are many great products out there, but Moloco and Tangent are consistently the gold standard. Many Exactrail and some Athearn Genesis cars also make that grade. The Wheels of Time recent entry into HO also deserves mention. The plastic “metal” siding was glued to a wood board for strength. 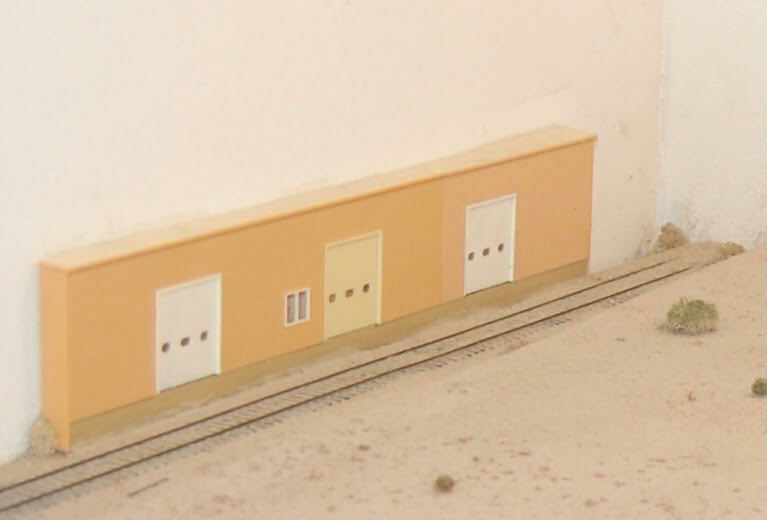 I removed the plastic door and window frames to provide a smooth surface and covered the “metal” siding with Faller Gmbh embossed building material-red brick (part #272-170608) and added a couple of doors made of Campbell Scale Models corrugated aluminum sheets (part # 200-801). I added plastic channel at the top of the doors to represent what the door rolled open on. I did not cut a door opening in the embossed brick sheet as this would have complicated the project. C. E. Hunt graciously provided the signs which really add to the finished look of the structure. I really like the feel of bringing in loads of feed to my back-dated structure. The difference between it as a 1990 structure and the back-dated version is pretty stark. It really is a joy to bring in one or two 40 or 50-foot boxcars back in the day when railroads still really appreciated carload traffic. Seems more civilized. A couple of neat visitors come to Carrizo Springs–one new, one pretty old. A couple of General American 50′ RBLs recently came to Carrizo Springs. I love these two cars. They represent the closing legacy of two of my favorite fallen flags–the Rock and the Wabash. 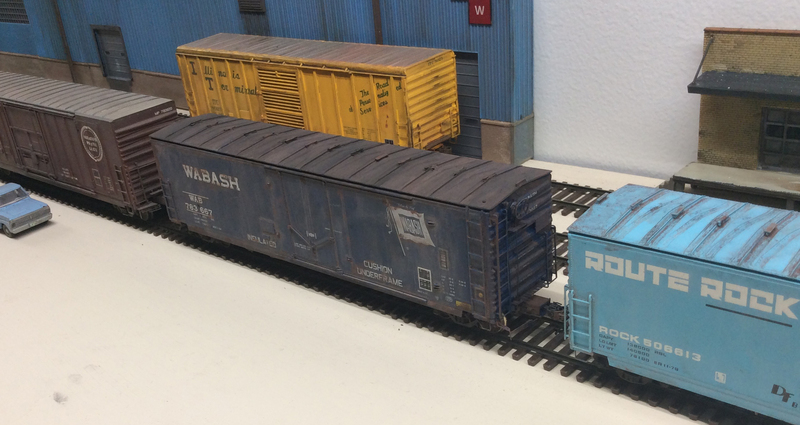 These are both Moloco General American 50′ RBLs. They are outstanding products. They are among the most well-researched and detailed cars on the market today. For other road names, click here. I like how Moloco’s website and Facebook page offer plenty of prototype photos and aid your modeling and weathering. Note: Some modelers have expressed concerns about the price of these cars and others, but I have come to the point that I want quality and accuracy over quantity. I’d rather have a few dozen super accurate cars than hundreds of “near cars” and foobies. Not saying my approach is better, we all have different takes on the hobby. That’s a good thing. As long as people enjoy the hobby, their approach is perfect! I really admire people who scratch build and paint cars as well. In reality, when I super detail a car, by the time I buy pinlifters, hoses, decals, scale couplers, better trucks and wheels, etc., it adds up closer to the price of these cars. The Rock car was easy to prepare for 1979. It was built in 1979. Only light weathering was necessary. It was hard to “lay down!” I like heavy weathering. It is a gorgeous car. It means a lot to me. I was practicing Little League baseball in Houston, the first time I spied blue Rock rolling stock cruising across the street from the field. Now the Wabash car was a little work, but well worth it I think. This is how it came from Moloco. Getting it ready for 1979 was interesting. It needed its roof walk removed. Then I added Moloco’s RB-0802 Roofwalk support brackets. Then I cut down the ladders, which was easy. Then I added ACIs, wheel inspection dots, lube plates and a ladder warning. Then it needed to be faded big time. I applied a very thin light gray wash a couple of times, followed by a burnt umber-grimy black light wash. I then dabbed a little dark rust and black powers here and there. It is a bit of an effort, but worth it to me. 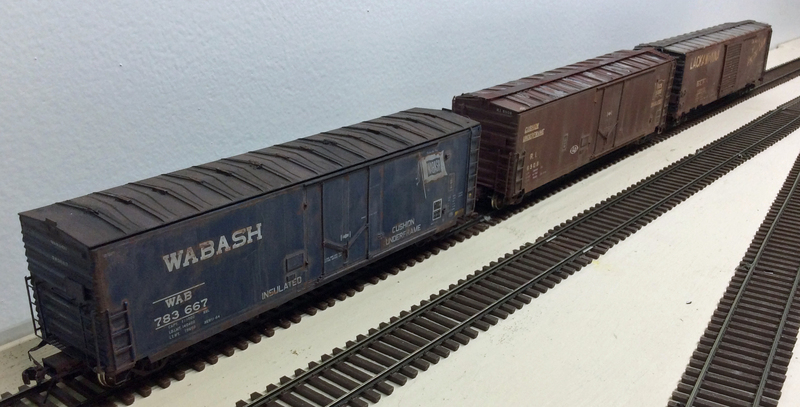 I have always wanted a couple of Wabash cars on my layout. Having it come into town maybe with a Norfolk Western boxcar will be nice. (The Wabash became a division of the Norfolk and Western in 1964 and was formally merged into the NW many years later. In 1979, there was a great diversity of Fallen Flag cars running the rails. The details on these cars are outstanding. 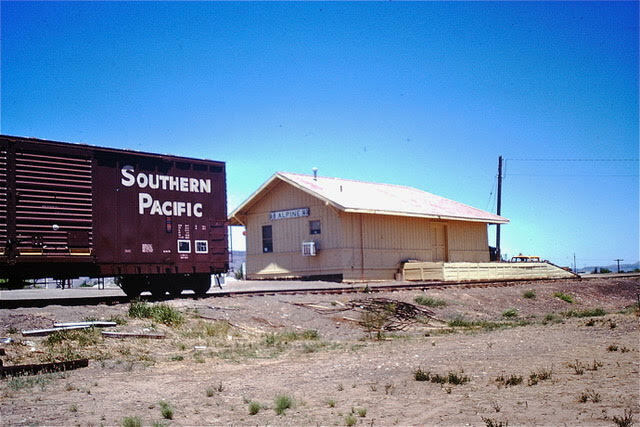 In 1976, the ATSF still had a full-time agent at their depot in Alpine, Texas. 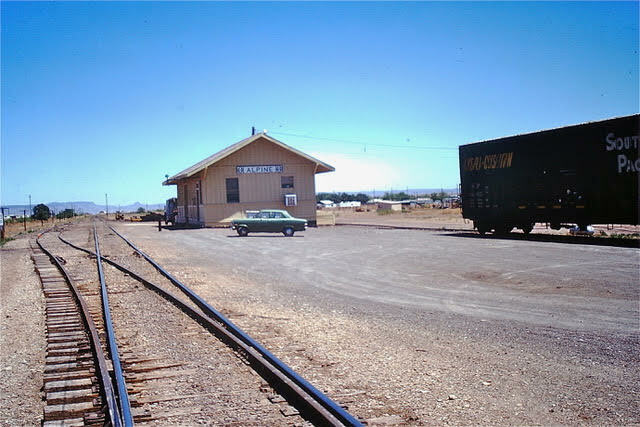 He claimed the boxcar sitting outside the depot one visit (June, 1976) was for the Safeway in town. I did not see the car being unloaded and do not know how Safeway transported what was in the boxcar to their store. They must have had a large truck is my guess. I took a picture of the car by the depot. I’ve often wondered what was in the car, I can’t imagine one food item going to the store in Alpine. It must have been many different food items that were loaded into the car at a large Safeway distribution center. 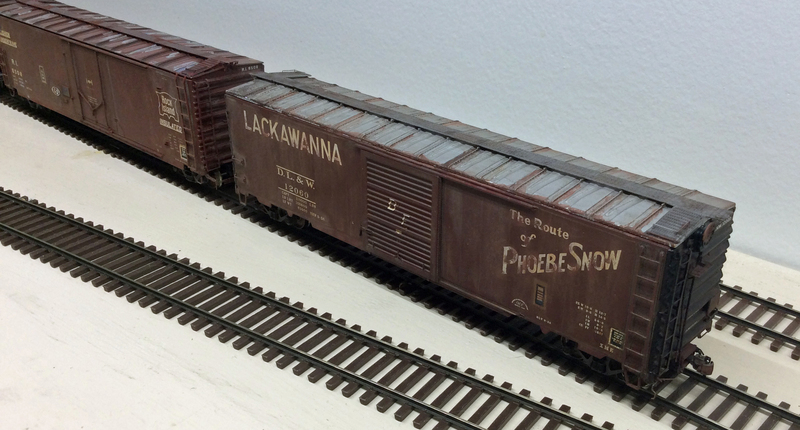 And it’s an SP boxcar. Did SP bring it to Alpine and interchange it to the ATSF? So many questions now I wish I had found answers to. I never saw another boxcar here after this one, so this may have been the last railcar shipment to Safeway in Alpine. The agent job was eliminated in 1978 and the agent transferred to San Angelo. 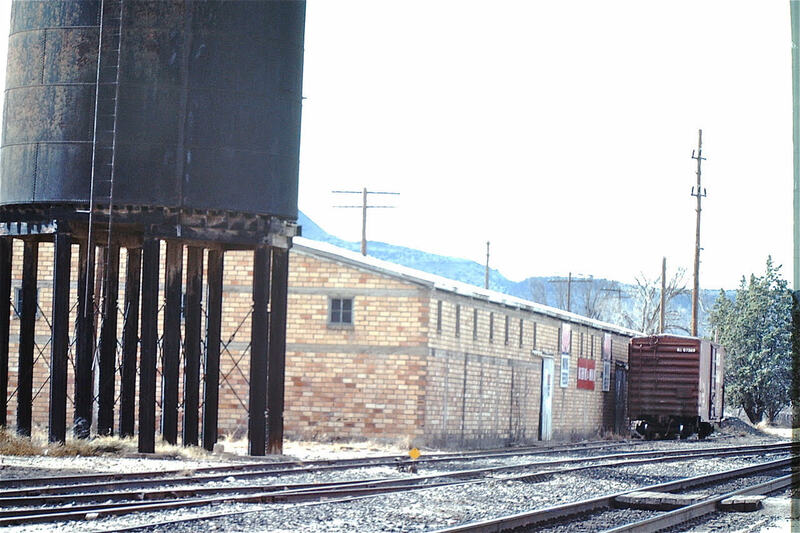 Interesting that it’s a double door boxcar, one you would expect lumber in, but in 1976, the Foxworth-Galbraith Lumber in Alpine had its own spur off the SP by the SP depot. Note: It’s great to have a story like this behind the elements of your layout. It makes modeling and operations so much more meaningful.